Shown in White/Cherry�Ankle length dress with full Tulle skirt. 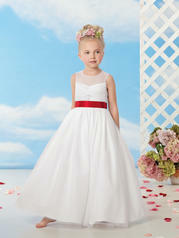 Knotted bodice with sheer neckline and Satin ribbon at waist. Available in ankle and floor length.